Honestly, I have no idea what was going on. It looks like a lot of fun, though. No, wait. That’s Craig Ball ’79 with beer uplifted. Also SRC. So it’s likely that it’s Beer Bike. Thanks for a lot of education and some great memories, Melissa! Additions and corrections to my earlier post! I asked my hubbie, Jim Pflugrath, a member of the SRC Bike Team all four years, to take a look and he suspects it’s the 1976 team. I think I misidentified both people I suggested as Vince and Tom, but now think I recognize Chris Jagmin as the man wearing the cap on the far side. This was definitely 1977. I am the guy in the middle looking directly at the camera, and surprisingly, without a beer in my hand. We were headed to Beer-Bike, but I don’t remember if Sid Rich won. The carnival photo is the same year and I remember going to that carnival with Tommy Kramer. 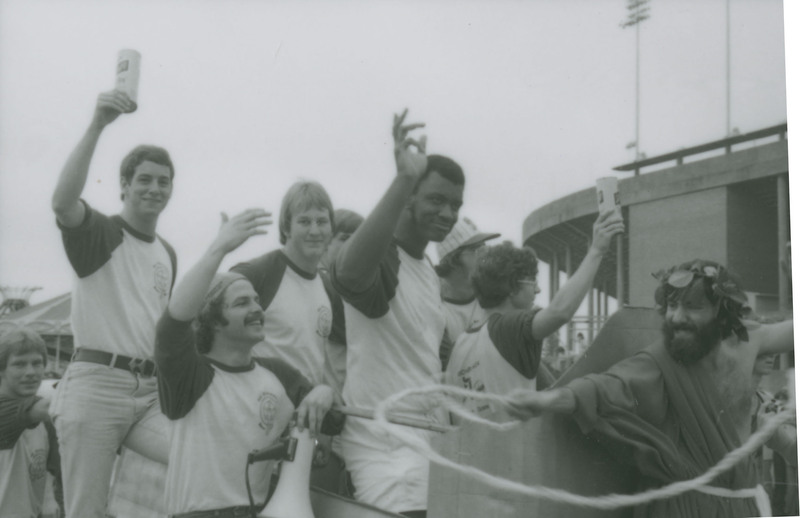 They had a game of tossing a football through a hoop for prizes, and Tommy Kramer, the All American Quarterback from that year, won a few prizes. Then Steve Garland (another QB) played and won just about everything they had. My brother John rode on the round ride in the middle with Bobby Tincher, and Steve Gleaves and Don Parrish paid the operator to run the ride as fast as it would go. It went so fast that John said it was pushing his head back, and he couldn’t get off it. What great photos. I’d love to see more from that era if they’re available. Oh, there are certainly more where these came from. I’ll see what I can find. And thanks so much for taking the time to comment. I really appreciate it. You mean Doug (Space) Garland, not Steve. Now that you tell the story I actually remember being there. With all the beer that flowed (at least in spring off-season for me), I’m sure there’s a hell of a lot of other things I have forgotten. I am having some issues with the comment feature, so if there is some duplication, please excuse. This was the Sid Rich Beer Bike team, no question. It was long enough ago that the precise year is ambiguous in my menory, but it was 1976-1977, I believe. Lou Ann is right in the names, I believe. Larry Johnson was in the pit crew (he did that for several teams for us). I forgot who won that year, but I think it was Will Rice. I do not remember a carnival, so I believe the other photo is from a different time. I did not look at that picture too closely, but in my time at Rice, the Beer-Bike track was in the stadium lot on the side between the stadium and the field leading to the RMC parking lot (well before the music school existed, or even Herring Hall). I believe the track got moved to the other side around 1982 or so. Matt’s right – while this is the Beer-Bike team, the carnival could not have been there during Beer-Bike because it’s sitting on the track. I matriculated in fall of 1976, and I don’t remember a carnival in the Stadium lot during my freshman year. If the picture was clearer, we should be able to tell what state Hanszen commons is in, and thus when the picture was taken. Melissa, can you make out Hanszen commons in the original photo? (The commons was rebuilt during the 1975-1976 school year). No, I don’t think I can. 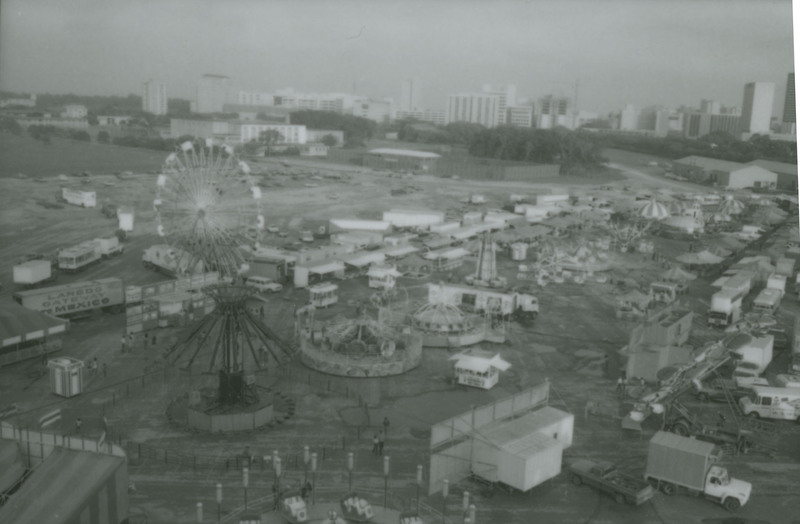 this picture is an enlarged scan of a really bad, tiny image on a contact sheet. When I have a chance I’ll go back to the sheet and scan a few more to see if there are any other images that might help–I can’t tell by eyeballing them because they’re so small. I am the person on the right of the photo wearing a “toga” and a crown of “olive leaves”. This was a beer/bike race, and this was our entrance. We created a chariot pulled by several SRC volunteers, and the team rode in in splendor. I was the Roman Charioteer. I am holding a rope with which I whipped the unfortunate volunteers to urge them to get us to the stadium parking lot more quickly. Steve Tighe is definitely closest to me, and Larry Johnson is third from me.